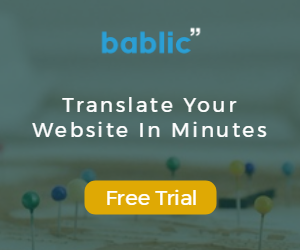 Over the past month or so, we’ve been getting the same question on several occasions which can only mean it’s time to address it on the official Bablic blog. Let’s first define proxy-based localization and snippet-based localization so we can then differentiate between them as well as list the pros and cons of each. Proxy-based localization is when all website communication between the end user’s browser and the website’s original server goes through the localization solution’s server (i.e. the proxy). For example, if localization company PRXLOCAL123 provides website translation/localization services for website example.com then it means that the translation of content is completely done on PRXLOCAL123’s servers. So when an end user asks for a different language on example.com, PRXLOCAL123 retrieves all of the page’s content from the server of example.com, changes it with the localized content, and serves the content to the end user. This whole process simply means the end user is in fact not connected with example.com but actually with PRXLOCAL123. This means the localization is “done” by the end-user’s browser, which only combines the localized elements, meaning just text, rich media and some CSS changes, instead of having to redirect ALL of the content like on proxy-based localization. – Requires no coding in integration – Proxy-based localization requires no change in the original website’s code. – Easier SEO solution – There’s no real difference to the search engine when Proxy-based translation is being used. – Performance – Since only the translated elements (text, rich media, CSS) are being served by the localization company’s server, there is less data being communicated back and forth which explains faster load times and better performance. – Doesn’t require DNS Integration – Unlike proxy-based solutions, snippet-based solutions do not require a DNS integration. – Works on sub-domains & sub-directories – Unlike proxy-based solutions, snippet-based solutions work on sub-domains as well as sub-directories which are widely referred to as a better SEO strategy. – No advanced SSL integration – No need for any special treatment for sites that are secured through SSL. Clearly, snippet-based localization is the future of website translation. Its performance in terms of speed is unmatched, as well as its unique ability to achieve complete localization (including popups, validation forms, tooltips & more). Let us know in the comments which is your preferred method of website localization and why! Amazing post! Thanks for doing this, Laurent!